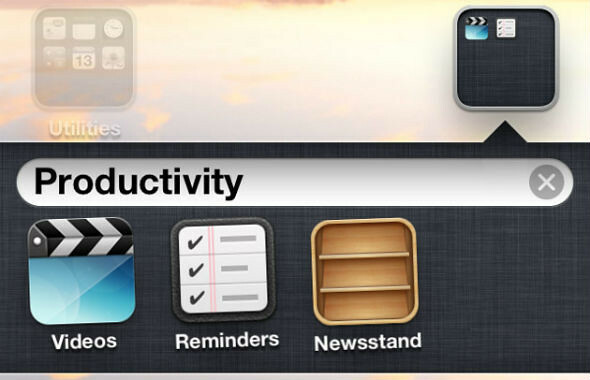 If you have tried to get rid of the Newsstand icon (like me), you would realise that you can’t. There’s no way to put in into a folder or delete it. Fret not. There’s a solution to hide it. 1) Drag one non-Newsstand app onto another non-Newsstand app. This will create a folder. 3) Bam! You’ve got a new folder, complete with the Newsstand app inside. So much room for activities! I just did it and it worked. Try it! 3 Responses to "HOW TO: Hide ‘NewsStand’ Icon On iOS5"
u should put a warning up there that while in folder, do not use the newsstand app as it will restart the iphone. I was so tired of that thing. That worked perfect on the first try. Thanks a million!